In January I attended a wine tasting of Dutch wine e-tailer vindict.com. The wine tasting was fun and I also liked the web site of vindict, which presents color, intensity, nose, aroma, smell, flavors, taste, body, alcohol, sweetness, acidity and tannin of each wine. Delivery is free for orders above € 70,=. 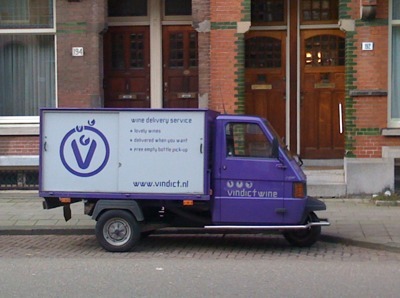 You choose your wines from their site, indicate which evening you would like them delivered and then just wait for the bottles to arrive in vindict’s trademark purple piaggio ape pick-up.